People are usually embarrassed when they slip and fall in front of other people, but does it make sense to feel shame and guilt if the reason for the fall was someone else's fault? If everything was safe with the floor surface, you may not have slipped and fallen in the first place. 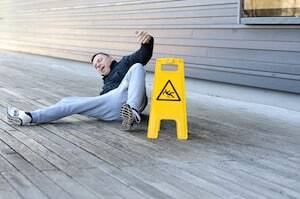 If you've been seriously injured in a slip and fall accident in Cape Coral and suffered injuries thereof, you may be entitled to compensation for your injuries and damages. The US legal system and Florida law provide an opportunity for people injured due to some other party's negligence and mistakes to recover financially by receiving fair compensation from the person or company who was responsible for the accident. That is why most injured victims choose to consult with the best slip and fall attorney in Cape Coral to understand their legal options. To determine if you are entitled to compensation and learn what your options are we recommend that you call our Cape Coral slip and fall accident lawyers at the Wolfson Law Firm in Fort Myers for assistance. We have helped injured victims of negligence in Florida since 1963 and we are ready to help you as well. Call us now at 239-777-9954 for your free consultation and get the information and answers you deserve. Remember, we don't ask for fees unless and until we recover for you. It is not Venice or Amsterdam; it is Cape Coral that has more miles in canals and waterways compared to any other city in the world. With 400 miles of waterways, the city is widely known as "Waterfront Wonderland." Most of them are navigable, but they have affected the local ecosystem as well. Cape Coral is in Southwest Florida on the Gulf Coast. On its west is Pine Island, while North Fort Myers in on the east. Fort Myers is on its southeast just over the mouth of Caloosahatchee River. On the north, it borders with Burnt State Marina and the Yucca Pens Unit State Wildlife Management Area. It is well connected to surrounding cities. Cape Coral Bridge and Midpoint Memorial Bridge connect the city to Fort Myers and Matlacha with the Pine Island. The Interstate 75 (I-75) passes not far from Cape Coral, offering a connection to Tampa and Miami. The Southwest Florida International Airport (RSW) is just 14 miles away. The population is estimated at 180,000. Most speak English as the first language while only 13% speak some other language as their first. In any slip and fall investigations it is extremely important to ask tough questions to clarify certain facts and assumptions. That's the first step toward building a compelling case. Then we will listen to what your doctors have to say about your injuries. Your doctor's opinion will assist us in proving that you deserve to be compensated for your injuries and damages. We will gather statements from any witnesses and employ the necessary experts to present your case in the best light possible. Then, we will proceed by proposing a settlement to the insurance company. They will have to respond in reasonable time. If they fail to make a fair offer, we will not hesitate to file a lawsuit on your behalf. Our goal is to resolve your case as soon as possible so that you could get your compensation and go on with your life, but we won't discount your compensation to reach a quick resolution. We will set a goal right from the beginning with you and will stick to it. You are the client and we are here to help you get what you deserve. Our Cape Coral slip and fall lawyers are available for free consultations at 239-777-9954. Do not hesitate to call us. We handle cases on a contingency basis, so you'll pay nothing until we recover for you. The Wolfson Law Firm is positioned at 3049 Cleveland Ave #140, Fort Myers, FL 33901 and proudly serves the neighborhoods and communities of Southwest Florida including but not limited to Fort Myers, Lochmoor Waterway Estates, Harlem Heights, Buckingham, Gateway, Babcock Ranch, Tice, Cape Coral, Punta Rassa, Boca Grande, Suncoast Estates, Iona, Sanibel, Page Park, San Carlos Park, Matlacha, Whiskey Creek, Pine Manor, Fort Myers Beach, Burnt Store Marina, Fort Myers Shores, Captiva, Tanglewood, Charleston Park, Palmona Park, Cypress Lake, Alva, North Fort Myers, Pine Island Center, St. James City, Lehigh Acres, Bonita Springs, Matlacha Isles-Matlacha Shores, McGregor, Olga, Bokeelia, Three Oaks, Pineland and Estero.